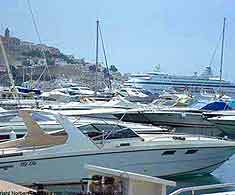 Being an island, Ibiza can only be reached by ferry or plane, with car rental companies often awaiting arriving passengers at the airport and the main harbour. Once here, those who prefer not to use a hire car can choose between buses and taxis to travel between resorts. Of note, from the airport, bus transport runs to Avinguda d'Isidor Macabich in Ibiza Town (Eivissa). Several different bus transport companies operate around the island and this way of getting around is extremely cheap. The main bus stop in Ibiza Town is to be found on the Carrer de sa Esglesia, where buses travel to and from the beach resorts on the northern coast of the island, as well as to Sant Antoni and Santa Eularia. Many young holiday makers come to the island solely for its hedonistic nightlife and glorious beaches. When the evening approaches, taxis are never far from hand in the principal resorts, being ready to whisk you to the top clubs, and later, back to your hotel. The island is served by Ibiza Airport (IBZ). Cheap flights to Ibiza are available from a number of the major budget and charter airlines, and last minute deals are frequently available. The majority of the top car rental brands are well-represented at Ibiza's airport, although for a more competitive deal, you should either book up before you fly, or look elsewhere, in the main tourist towns. Car hire outlets in Ibiza Town can be found located along roads such as the Avinguda de Bartomeu Vicent Ramon and the Carrer de Felipe II. The island's main highway heads through the capital and is named the Carrer de Sant Jaume. Scooters provide an easy way to travel around the island of Ibiza and are a very popular method of transport. They have the advantage of being fairly cheap to hire and can transport you to some places that are not so easily accessible by car. Those who are planning to use the island's network of buses and feeling the need to be organised should pay a visit to one of Ibiza's many tourist outlets to pickup a copy of the island's bus timetable, known locally as the Horario y Lineas de Autobuses. 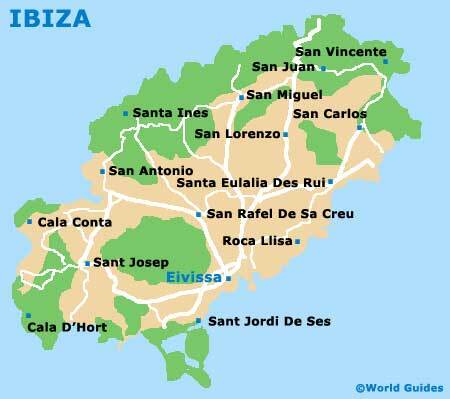 Popular routes connect Ibiza Town with Cala Llonga, Platja d'en Bossa, Sant Antoni de Portmany, Sant Jordi de ses Salines and Santa Eularia. At night, a special bus service travels between the hotels and the top nightclubs. 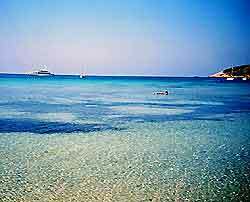 Taxis in Ibiza are a useful way to travel to and from the main beach resorts and nightspots. Meters always start with a basic fare, with additional surcharges being added for excessive luggage, night-time trips and journeys on Spanish holidays. Taxis are never far from hand at the principal beaches and resorts, such as Cala Benirras, Cala Codolars, Cala de Boix, Cala Mastella and Cala Xarraca. If you intend to bring your own set of wheels to the island of Ibiza, you will need to travel onboard a ferry (choose between fast and cheaper slower ferries). There are regular services that sail between coastal towns on the Spanish mainland, such as Alicante, Barcelona and Valencia, as well as the harbours of Mallorca and Menorca.